Nestled on the corner of Clinton Avenue, from the outside, Vauxhall, in downtown Huntington Village, might be easy to miss. However upon entering the room one immediately feels something special. For me it was the casual, warm and rustic atmosphere that immediately invited me to sit, relax and order drink. Vauxhall displays an impressive and diverse list of craft beers along with Prosecco. Not being a “craft-beery” girl myself, instead I chose to peruse the specialty drink menu. That’s when I happened upon the Vauxhall Stout. I absolutely love Guinness, so I was drawn to the richness of the drink. What made the Vauxhall Stout extra special was the cold brew coffee added, which gave it an excellent depth of flavor. I investigated the cold brew coffee thing further, that’s when the manager offered me a sample and explained to that the coffee is carbonated which is what gives it a frothy foam and a silky smooth texture. Needless to say I was impressed. The bonus is I drank alcohol and didn’t sleepy. Then it came time to get down to business and sop up some of the alcohol I had just ingested. The Vauxhall wait staff was both helpful and accommodating. For starters, Vauxhall offers a variety of choices on the menu, but what really peaked my interest after finishing my Vauxhall Stout was the fresh baked warm pretzel with ale mustard cheddar dip and onion mustard seed relish. When my pretzel arrived it was crusty, doughy, golden brown and warm from the oven and served with a beer cheese sauce and mustard relish. The star sauce is definitely the mustard relish. It has a sweet, briny mustard flavor that compliments the pretzel very well. The texture of the mustard relish is what put this choice at the top of my list. The mustard grains are large and which pop in your mouth. I almost tried to order a couple of gallons of the mustard relish to take home to use as a condiment for breakfast, lunch and dinner. As I was already on to my second Vauxhall cocktail, I immediately dug in. The menu features mainly burgers but those burgers are not your average bar burger. I absolutely had to order the Ramen Burger, because who doesn’t want a crispy bun made of ramen noodles? I ordered my burger mine medium rare and when it arrived at my table it was perfect. 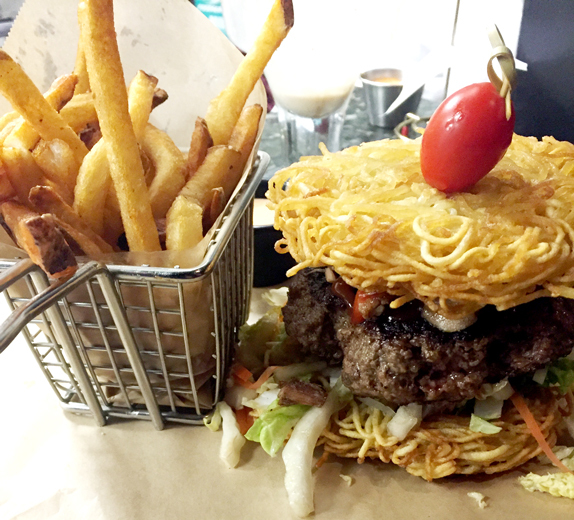 The Ramen burger is topped with a pickled cabbage slaw with compliment the burger perfectly and fresh cut French fries that were super crispy. While a bun made of ramen noodles was not super easy to eat I solved the problem with a fork and knife. By the time I finished eating the Ramen Burger I had a belly full of brew, bread and beef. However, a full belly did not stop me from perusing the dessert menu. The dessert menu includes Homemade Donuts. The fresh donut holes were my go-to because even after hot pretzels, beer and a Ramen Burger one can’t have enough dough. Dessert arrived and I was more than happy to dive into these warm donut holes, which arrived dusted with powdered sugar and were served with three types of dipping sauce, vanilla, chocolate and raspberry. The donuts are a winner. 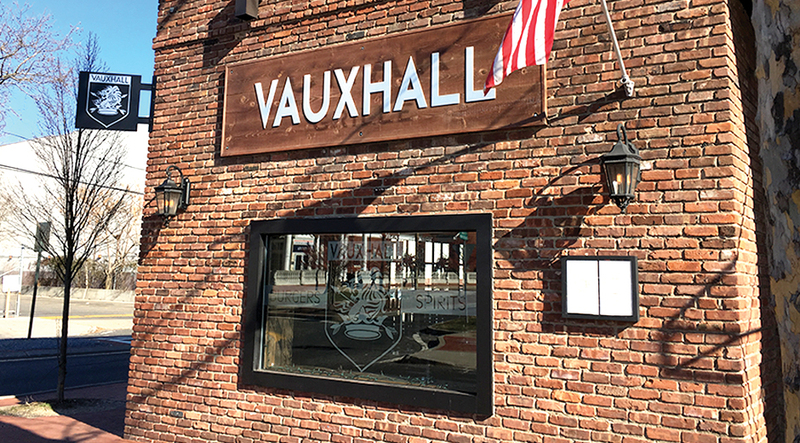 All in all, the experience at Vaux Hall with its charcoal gray walls, rustic wood accents and wall of antique style mirrors, not to mention my witty and entertaining server, made me feel super comfortable, which is why I was not looking to leave the cozy atmosphere. The Vauxhall vibe is just what Huntington Village needed and I look forward to going back and sampling more from the menu. So, if you are looking for a casual but hip, generally frat boy-free place to relax and get something to eat other than a Bud and bucket of Buffalo wings, Vauxhall is definitely the place.